So we've seen the new iPhone, and had a chance to briefly play with it at the demo room, but as I've learned in the past so many times you only really know a handset after you've taken a look at the FCC test reports or spent a few days with it yourself. On my flights home, I typed up our iPod and EarBud impressions piece, but also pored over those FCC test reports for the iPhone 5, and it became immediately obvious the iPhone 5 doesn't support simultaneous voice and data on CDMA2000 carriers such as Sprint and Verizon in the US. The reasons, as always, are somewhat technical but at a high level pretty simple. Suffice it to say that at a high level this is a design decision which makes the phone as small and light as it is (it really is light, almost alarmingly so) and enables it to support a wide number of LTE bands, rather than some major oversight like I've seen it portrayed. First, a bit of overview. At the Apple event there were two physical hardware models for the iPhone 5 announced: A1428 and A1429, with three different provisioning configurations. There are hardware differences between the two models, and what provisioning boils down to is both how the phone is initially provisioned, and likely what AMSS (Advanced Mobile Subscriber Software - Qualcomm's software package that runs on the baseband) gets loaded at boot. This is analogous to how with iPhone 4S there was a single hardware model, but two different configurations for CDMA and GSM. For the most part, the two hardware models are identical, and to most users the two models will be indistinguishable, but there are physical differences to accommodate a number of different LTE bands between the two. 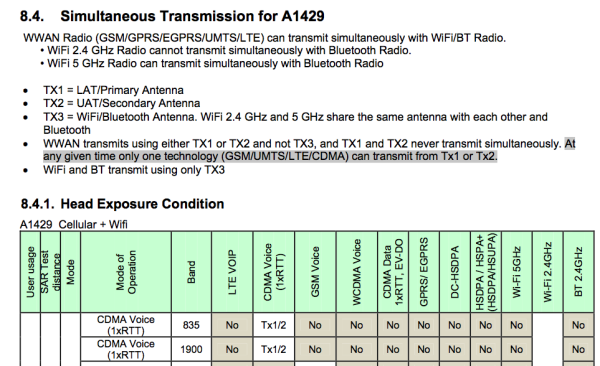 The Apple iPhone 5 specs page lists this at a high level, and there's an even more explicit LTE specific page with a list of what LTE bands work for what carriers. Of course, what ultimately really matters is what's in the FCC docs and in the hardware, and looking at those there are a few more bands supported than listed for LTE. Why this is the case is interesting and a function of transceiver and Apple's implementation – with Qualcomm's transceivers (specifically RTR8600 in the iPhone 5, but this applies to others as well), each "port" is created equal, and can handle WCDMA or LTE equally. If your design includes the right power amplifiers (PA), filters, and antenna tuning, you're good to go, which is why we see LTE testing reports for bands that aren't listed otherwise. I saw this same behavior with Apple's test reports for the iPad 3 with LTE as well, there were many more tested configurations than what any carrier in the USA will run, but remember Apple's approach is about covering as many possible configurations as possible with the fewest number of SKUs. So you can see how with two different hardware models, Apple is able to support no fewer than 8 LTE bands with largely the same hardware – the same display, chassis, battery, form factor, and PCB outline (different power amplifiers and filters are required), and roughly the same exterior antennas (gain is different on the primary bottom antenna between the two models, no doubt they're tuned differently). Previously most handsets I've seen have been destined to work only on a single carrier, and thus implement at most one or two LTE bands. If you look at Apple's iPhone lineup historically, there's this obvious two year cadence which jumps out at you, and it applies even to cellular. I've removed the CPU and GPU parts so this table doesn't get too huge, but historically Apple has been very careful about engineering a platform that will last for a while. It was touched on in the keynote, but the iPhone 5 likewise inherits the two-antenna cellular design that was touted from the 4S. This is the original mitigation for iPhone 4 "deathgrip" which was introduced somewhat quietly in the iPhone 4 (CDMA), and carried over to the 4S with one additional improvement – the phone included a double pole, double throw switch which allowed it to change which antenna was used for transmit as well to completely quash any remaining unwarranted attenuation. While receive diversity was a great extra for the 4S that drastically improved cellular performance at cell edges, in LTE 2-antenna receive diversity is now thankfully mandatory, leaving the base LTE antenna configuration a two-antenna setup (two Rx, one shared for Tx). Thankfully, Apple already had that antenna architecture worked out with the 4S, and carried it over to the iPhone 5. So now that we're done with all that, where the heck does simultaneous voice and data fit into the picture? Again, it comes down to antennas, design decisions, and band support. First a bit of history: first generation LTE phones on Verizon used a combination of two cellular architectures to deliver both LTE and CDMA1x/EVDO capabilities. Quite literally there were two basebands, two transmit chains, and at least three antennas: a two-antenna setup for LTE, and 1 transmit for CDMA 1x/EVDO duties. 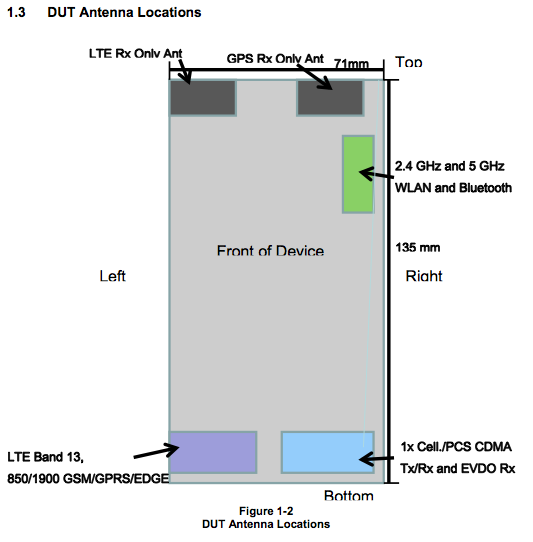 Usually this boiled down to a shared diversity receive antenna for LTE and CDMA 1x/EVDO, and discrete transmit antennas for LTE and CDMA1x/EVDO. Modernizations from Qualcomm have since reduced the number of digital basebands required to just one (with MSM8960 and MDM9x15) which helped improve battery life, but the end implementation still requires the same three-antenna solution. This configuration enables both SVLTE (simultaneous voice and LTE) and SVDO (simultaneous voice and EVDO) with one modem but still requires those two transmit RF chains to work for CDMA phones. I should mention that these methods are all in place to accommodate the fact that as of yet almost no CDMA networks implement VoLTE (Voice over LTE or Voice over IMS), except MetroPCS. To make this single radio simultaneous LTE and CDMA architecture work requires making another RF path. On WCDMA/GSM carriers, the path forward until we get to VoLTE is what's called circuit-switched fallback (CS-FB). This quite literally means you drop from 4G LTE to 3G WCDMA (where voice and data are already multiplexed) for the call, then hand back up to LTE when you're finished. This is the way that voice works at the moment for all GSM/WCDMA carriers, and on all those handsets with LTE to date. So onto the iPhone – we know definitively that the iPhone 5 definitely doesn't support either SVDO or SVLTE. It's as simple as looking at the FCC documents and the appropriate sections in the allowed and tested simultaneous transmitters section for SAR (Specific Absorption Rate) testing. There, it's spelled out that only one air interface can be active at a time, and that only one antenna can be selected for transmit at a time. There's also an explicitly called out mention to VoLTE not being supported at present. I didn't replicate the entire table of simultaneous transmission combinations which need to be tested (it is a huge table) there are no entries with CDMA Voice being active at the same time as any data mode save WiFi. This has been confirmed as well by later statements by the carriers and Apple. From Apple's perspective, no doubt the iPhone 5 not supporting simultaneous voice and data on CDMA carriers isn't the end of the world. After all, iPhone 4 and 4S customers have ostensibly been using their phones without that functionality just fine for some time now – this is just a logical extension. At the same time, LTE handsets on Verizon and Sprint which currently support both SVDO and SVLTE will have a differentiator, and from what I've been told the inclusion of SVDO is more of a "delighter" than core feature. What it really boils down to is that by using this single Tx chain, Apple is able to support a ton of LTE bands (more space for PAs and fewer transceiver ports used on SVLTE for CDMA networks) and also do it without making the iPhone very large. Moving to an architecture that works with SVDO and SVLTE would require an additional transmit path and antenna, and incur a size and weight penalty. The other reality is that CS-FB is the way voice coexists with LTE in the vast majority of cases globally, and thus engineering all that just for CDMA networks is at odds with Apple's ultimate desire to deliver as few models as possible. In the future all of this overhead to implement voice with legacy 3G and 2G networks will largely go away and exist only as a handover option for when LTE service isn't available. Voice over LTE is indeed coming soon. 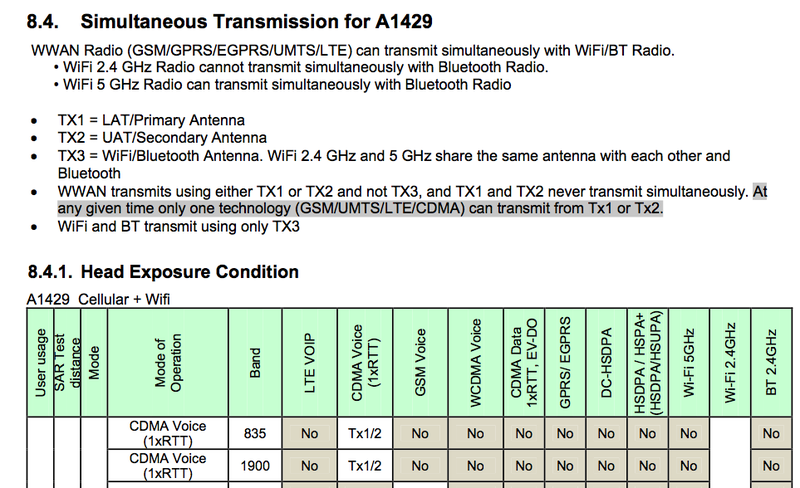 Update: The other LTE related iPhone 5 thing to explain is why LTE support for 800 MHz and 2.6 GHz isn't present. This article originally started as an explanation for why SVLTE and SVDO support are not absent, I think there's even more discussion necessary about what the likely plan of attack from Apple is for including both more LTE bands and that TD-SCDMA phone for China. I plan to address that in our upcoming review. Is Voice over LTE a software upgrade for Verizon? 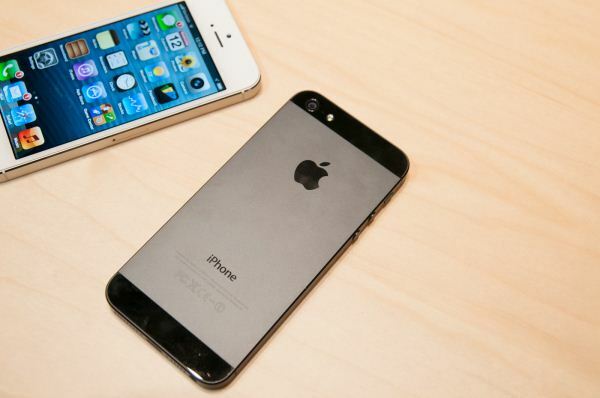 Does the iPhone 5 architecture support voice over LTE or is it just unsupported in software? The core network of the provider needs to support it VoLTE in order to used by any handsets first. While this is "just a software update for Verizon" you can figure it is not something they are just jumping to upgrade it - after all, the WHOLE network will shut down if something goes wrong in there..
"Every carrier could implement it their own way and it would still universally work..."
As for dates, in early 2012 VZW said they planned to roll out VoLTE nationwide in early 2013. At that time, they were already testing the service in two US cities; and I've not heard of any change to this plan. So when you're buying things from Qualcomm, imagine a big form with checkboxes and dollar amounts next to those checkboxes. Check the box, get the feature, but pay the fee, basically. Then you get shipped this software package and are allowed to compile your own AMSS and push that to phones. If you didn't pay for it, it isn't in the bundle. I have no doubt that this is a cost reduction measure so Apple doesn't have to pay for features that aren't going to get used on the vast majority of handsets sold internationally.